Located 4 miles east of Bellevue, Ohio, at 5001 State Route 4, Historic Lyme Village is operated by the volunteers of the Historic Lyme Village Association. Among the buildings in the village is the John Wright Mansion. 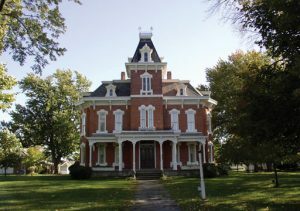 This Second Empire Victorian Home was built between 1880 and 1882 and is listed on the National Register of Historic Places. The John Seymour House, an 1836 Greek Revival House, was used as a stop on the Underground Railroad. The village is home to 14 other 19th Century buildings including log homes, barns, one room school, general store, town hall, and the Detterman Log Church. The village is also home to the Schug Hardware Museum and the National Postmark Collectors Museum and Research Center. Historic Lyme Village is open for guided tours 11am to 4pm Tuesday through Saturday and 12pm to 4pm on Sunday in June, July, August, and Sundays only in September. The village is host to many special events including Pioneer Days, A Night at the Village, Victorian Christmas Dinners and Christmas of Yesteryear. The air-conditioned Carriage House Café and Shelter are available for rent throughout the year for parties, picnics, luncheons and receptions. The Detterman Log Church, John Wright Mansion and village grounds host many weddings during the year. The independent Historic Lyme Village Association is a non-profit (501(c)3) all volunteer organization.